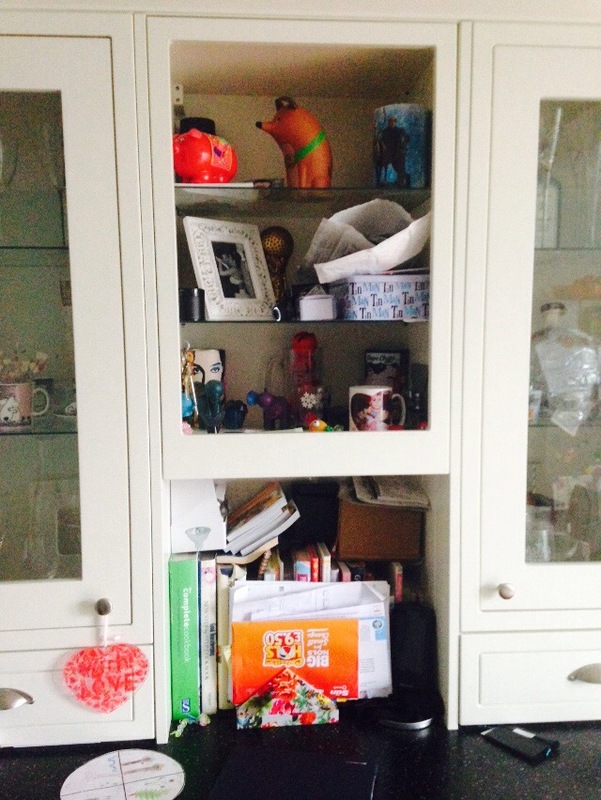 I love changing things around in the house, however small it is – maybe I’ll move the bin over there, into the other corner? Yes, perfect…. all is ok until I put a mouldy banana on the chair which is now occupying the original home of the bin. Or maybe I’ll swap a few pictures round or rearrange the toy corner so the kids can’t find any of their toys. Just as we get used to it I’ll change it again. I like change. I get bored. I’m always looking for little tips on Pinterest; Pinterest – my other love, besides family, food and friendship…and cheese…..and wine, hmm…and clothes….ok, so I have a few ‘loves’, anyway I like looking for things which improve the look of my home or things which don’t cost much but make a big impact on my life, I get weirdly very excited about it. Beardy called me a geek the other day because I did this…. But I love it, I think it’s pure genius! 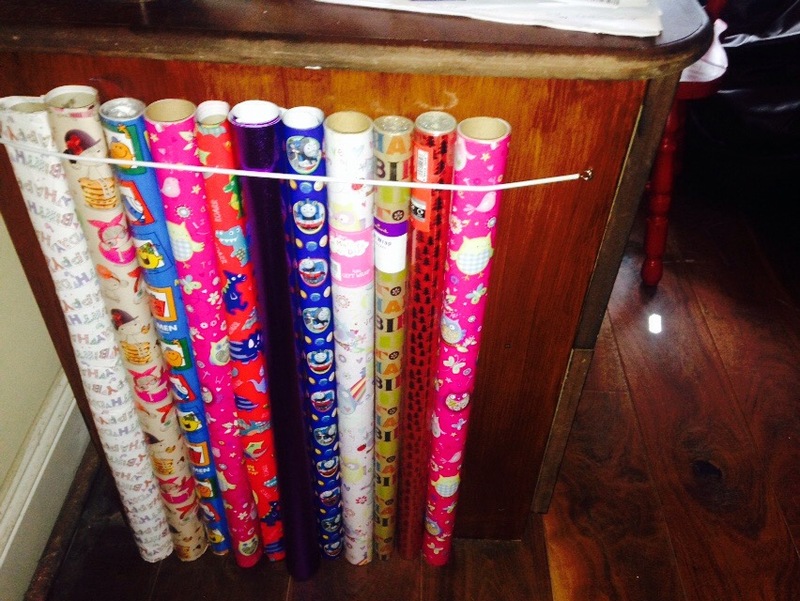 My wrapping paper supply always used to fall over the floor, unravelling, getting trodden on and ripped – it drove me bonkers! Now it makes me smile every time I walk in the den. Ok, I may be a tiny bit geeky, but geeky in a good way right? I also have an obsession with baskets, I love a basket! Beardy gets angry with me, “uh, another f***ing basket! Stop buying baskets!” Sometimes I swap baskets around to confuse him so he thinks I’ve bought a new one when really it’s just the one that was somewhere else (snigger), then I feel good because it’s like getting a new basket for free! Ok, it’s not like that at all, but I know what I mean. It’s like when I say to Beardy ‘I WON! I won that thing on eBay! Woohoo!’ And he’ll say ‘YOU DIDN’T WIN IT, YOU HAVE TO PAY FOR IT – that is not winning!’ I suppose he’s got a point. 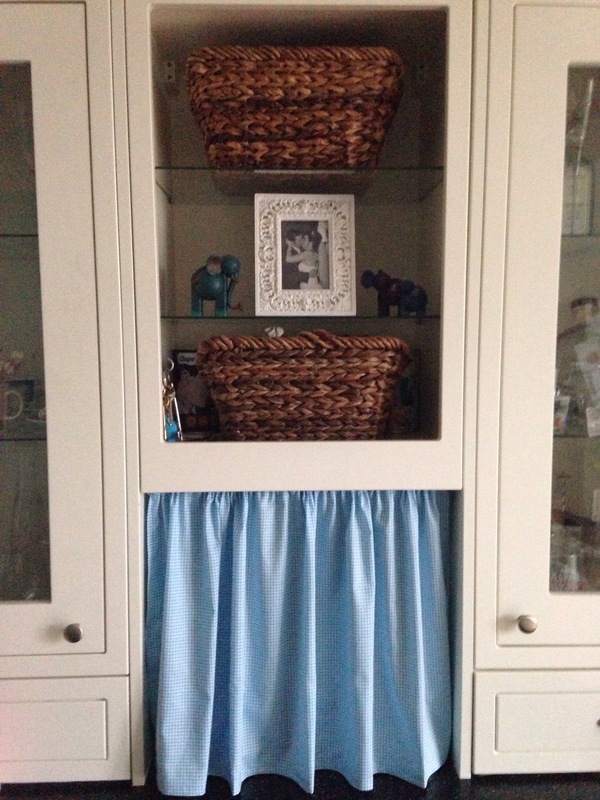 Anyway, shoe basket, toy basket, basket for accessories, you name it I’ll find a basket for it, so my next de-cluttering hack was the dresser – I got mum to make me a little curtain to hide all the crap that’s accumulated on there (thanks mum) and of course added a few baskets!…. Love it. Baskets AND crafty hack combined! BAM!